An analogue stompbox loaded with bucket brigade chips for deeper, sweeter swells. 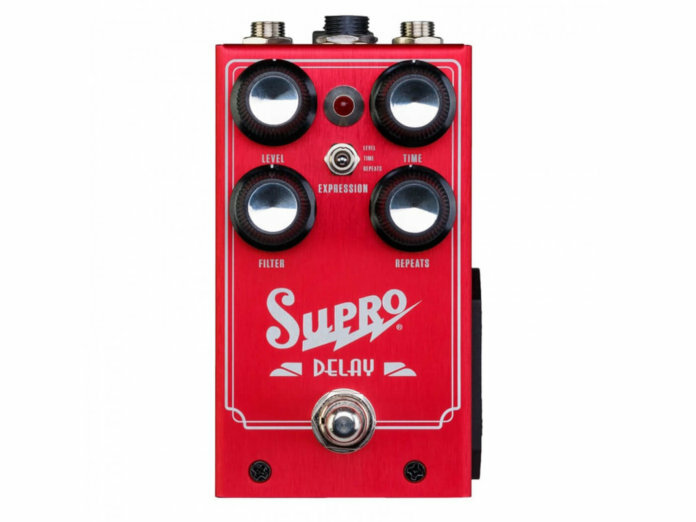 Supro continues its impressive NAMM run with the 1313 Delay, a high-end, all-analogue pedal that delivers buttery, old-school delay. That’s thanks to the MN3005 bucket brigade IC chips fitted in this stompbox, which allow for a wide range of sound options including 20ms slapback and up to 600ms of smooth, vintage-voiced delay. The chips are also equipped with 15-volt power rails, which provide sweeter-sounding echoes, greater headroom, and a broader dynamic range. Tthe 1313 boasts an interesting filter control that arms you with low-pass and band-pass filter options. With these functions, you can produce dark and murky echoes – usually associated with bucket brigade delays – and bright tape echoes that continually morph as repeats are extended. Otherwise, you’ll find standard time, repeats and level knobs in the pedal’s control system. You can also control three parameters – level, time and repeats – individually via a standard TRS expression pedal. To select these parameters, simply toggle the three-way expression switch. Retails at $249. More information at suprousa.com.